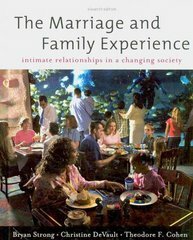 The Marriage and Family Experience: Intimate Relationships in a Changing Society 11 Edition THE MARRIAGE & FAMILY EXPERIENCE is a realistic look at relationships today. These experienced authors will help you see and understand the underlying issues at work in marriages, families, and all kinds of relationships. Real-life cross-cultural examples and features that encourage you to look deeper at yourself make the Tenth Edition accessible and compelling this is a book you can relate to and one you will want to read! The book presents the latest information on adoptive parenting, childbearing patterns, gay and lesbian families, the meaning of virginity, gender roles and sexuality, communication and conflict resolution, the influence of popular culture, and working families. With thorough and compelling coverage of all kinds of today's families and relationships, the book dispels myths about gender differences and gives you a realistic and comprehensive overview of the concepts and topics you'll need to succeed in your course.